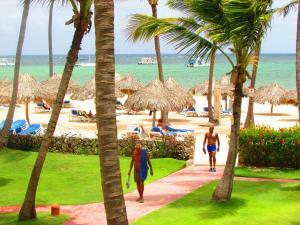 Address: El Cortecito, Los Corales Bavaro, Punta Cana (Gran Santo Domingo), Dominican Republic. Offering free WiFi and a year-round outdoor pool, Los Corales Beach Villas is set in Punta Cana. Freshwater lagoons is 19 km from the property. Free private parking is available on site. The accommodation is air conditioned and features a seating area. Some units feature a terrace and/or balcony with sea views. There is also a kitchen in some of the units, fitted with a microwave. There is a private bathroom with a bath or shower in every unit. Towels are provided. Los Corales Beach Villas also includes a spa centre and offers massage treatments. Guests can enjoy a meal at the on-site restaurant. The property also offers grocery delivery. The property has a private beach area and car hire is available. A number of activities are offered in the area, such as snorkeling and diving. Cap Cana Marina is 20 km from Los Corales Beach Villas. Punta Cana International Airport is 14 km away. Please be informed that credit card will be used for guarantee purposes only. A prepayment deposit via PayPal is required to secure your reservation. The property will contact you after you book to provide an transfer instructions. Please note that the electricity USD 7.00 per night is charged separately in cash. A security deposit of USD 300 in cash or via PayPal is required for incidental charges. This deposit is fully refundable upon check-out and subject to a damage inspection of the accommodation. Please inform Los Corales Beach Villas in advance of your expected arrival time. You can use the Special Requests box when booking, or contact the property directly with the contact details provided in your confirmation. A security deposit of USD 300 is required upon arrival for incidentals. This deposit is fully refundable upon check-out and subject to a damage inspection of the accommodation.